I don’t know about you, but when I’m interested in some blog, one of the first things I’d go to would be their “About” page. You know, I like to see who’s that fantastic creator behind ‘that blog’. I find it even more attractive when they write a personalized one, where they share their story and what they’re all about. Not just a generic one stating when and where they started. So, if you want to make your blog AWESOMEE-RRR….you need to write an about page that sizzles! You can also use your about page to tell your credentials as to why your visitors should even bother reading your blog. More importantly, you want them to recognize you as someone. Right? This is your chance to show your visitors how precious you are. Put it simply, the “About” page is a biography page infused with story-telling elements to make it a more interesting read. Then again, as easy as it is to say that the “About” page is important, making one is a completely different story. 1. Describe your blog. The “About” page is not always about YOU, but rather, about your blog. Tell people what it is all about, why you made it, and most important of all, how you can help your readers. Make sure to answer those questions as clearly, yet as creatively as possible. Don’t just put straightforward answers. Remember, people read blogs because they want to gain knowledge and be entertained, not just any one of the two. 2. Tell them about yourself . Or the people behind your blog. Let your visitors know you who are. Let them know why they should trust you. Prove that you’re someone knowledgeable in your chosen field and in the particular niche that your blog belongs in. Don’t forget to add some personality! 3. Add your picture in! Readers are more likely to trust someone that they can see. Remember, the only way to communicate at a personal level is to show people your face. I mean, think about it, would you be willing to trust someone who hides behind a mask? Besides, you can use your pictures in a few creative ways to make your page look unique and exciting! And please, don't use photos that are too small and too BLURRRRYY to see. Big NO. 4. Share your story. Not only must you tell people who you are, but you must also tell what your story is. Remember, you’re going to communicate with your readers at a personal level, and nothing says more about personal than telling them parts of your life story. You want them to relate with you. Let them know what made you start a blog, how you built it, who inspired you, etc. 5. Show off your favorite and/or most popular posts. It's also your way of advertising some of your posts, especially those that you find most useful or most entertaining. If possible, include a list of at least 5 of them somewhere in the middle or bottom of the page. Make sure that the list doesn’t look out of place as well, or if you want, you can put it in a sub section in the page so that it looks good. 6. Include your contact info. How can they reach you? Of course, what good is a biography if you don’t leave some of your contact details? Tell them where they can contact you whenever they need help in something related to your blog. If you have a separate contact form, add the link to your contact form. And, don’t forget to plug in your social media accounts! 7. Add a call-to-action (CTA). What do you want them to do next? Much like how salespeople have a closing phase wherein they try to close the deal, this is also where you try to convince people even further to read your blog. You can either ask them to subscribe, or follow you on social media networks. Make sure to use a good CTA that will make them want to be one of your loyal readers for a very long time. Fun facts. A few fun facts about yourself, such as how you hate spiders, etc.. but do not overdo it. Favorite tools. Tools such as plugins, software and programs that you use often or would want to recommend. Awards, recognitions, accomplishments, the works. All of these help establish your position as a reputable source of information in your niche. Quotations. Share your favorite quotes. You never know, they might like it too! Your workplace. Take pictures of your office or your workplace as well. 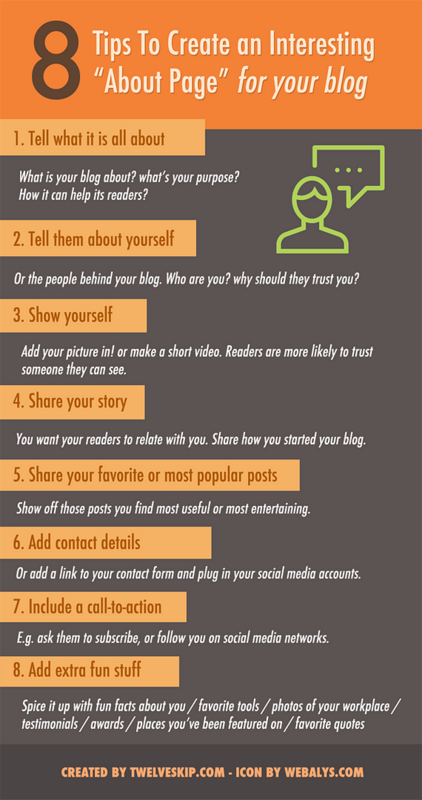 This is particularly important if it is a business blog. Short Video. Want to be more remarkable? If you’re comfortable talking in front of the camera, record yourself and introduce YOU and your story through a short video. Here’s my favorite one: John Lee Dumas' Video Story. You can find more inspirations on Youtube. Testimonials. Testimonials of some of your past clients and customers help improve customer loyalty and trust, making it a great addition to your page. As you can see, making the perfect “About Me” page for your blog is not as hard as you can think it is. Yes, it may make for quite the lengthy process, but still, by using the tips above as well as applying your very own creative thoughts, all of your efforts will be well worth it. What about you? How do you spice up your "About Page" to make it more interesting?